If you have the fonts on your computer, it’s easy to visually compare alphabet lengths of different typefaces (and sizes), as shown above in these 24-point settings. All three of these text blocks set at 15 point have the same number of words per line, but the width of the columns varies with the font used. 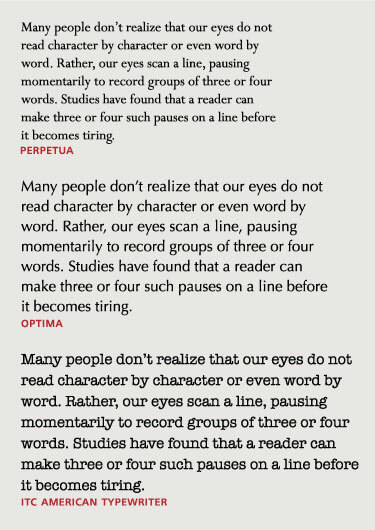 Column width affects readability because of the way our eyes read. Many people don’t realize that our eyes do not read character by character or even word by word. Rather, our eyes scan a line, pausing momentarily to record groups of three or four words. Studies have found that a reader can make three or four such pauses on a line before it becomes tiring. To determine line length for optimum readability, a good guideline is between 9 and 12 words for unjustified text. Fewer words may cause the sentence structure to break up, and may also result in too many hyphenations. Both of these reduce readability. Conversely, a line with more than 12 words can become tedious to read. Additionally, a reader can easily get lost when going from the end of one long line to the beginning of the next, and may inadvertently reread the same line, or miss a line or two. With justified text, the number of words per line should be between 12 and 15 words per line, to avoid excessive hyphenations, uneven word spacing, and rivers of white space in the text. typeface (or font): The width of the individual glyphs and the overall typeface design affect the word count per line. point size: The size of the type affects how many words fit in a line. average word length in the copy: You can fit a greater number of shorter words than longer ones in a given column width. 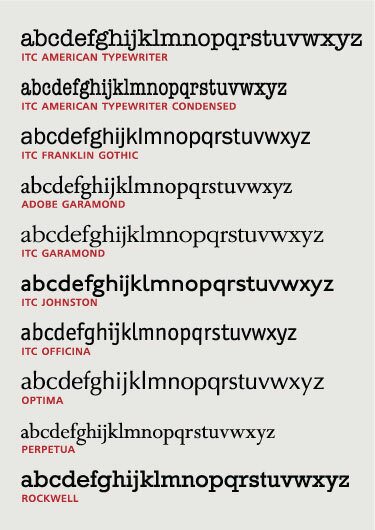 Typefaces vary in their alphabet length. The alphabet length is determined by the width of the lowercase a through z, historically measured in points. This measurement varies depending upon the typestyle and point size being used. Therefore, varying the font and/or point size will affect the optimum column width. The final factor to take into account when deciding upon the appropriate line length is the nature of the actual text. For instance, some content – such as medical text – might involve many longer words, lending itself to a wider column width to avoid excessive hyphenations. On the other hand, text used for children and young readers might involve many short words, allowing for a narrower column. The narrow setting in the upper left only fits three to five words per line, interrupting the sentence structure and thus sacrificing readability. Conversely, the setting below it challenges the reader with its wide column width containing 15 to 18 words per line, which can become tedious to read. The setting in the upper right is “just right”! Webwise: On the Web and on tablets, e-readers and other mobile devices, type size and line length are not always fixed measurements as they are in print. Appearance can vary depending on the viewer’s platform (Mac or PC), browser and version, screen resolution, default or customized preferences, as well as on how the the text is coded. Nevertheless, the principles of what constitutes effective, readable text remain the same, even when the particulars vary.